Shopop is an advertisement supported program which may be employed to flood your web browsers with various online offers, deals and advertisements. 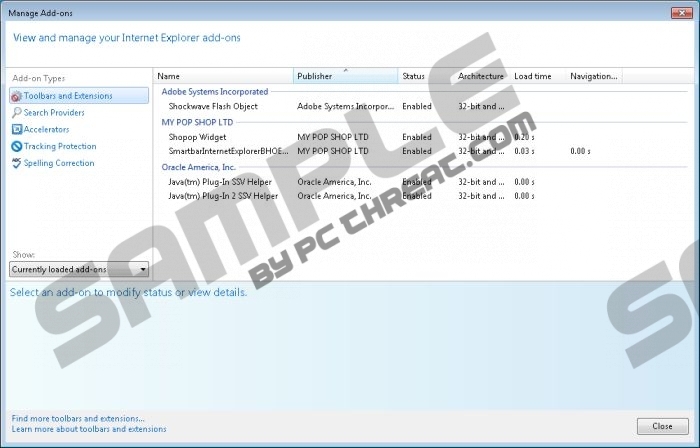 Also known as Shopop Widget, this application is presented at shopop.me and is published by My Pop Shop Ltd. As malware researchers, who have analyzed this adware, have discovered, the application can be installed onto Mozilla Firefox and Internet Explorer browsers running on Windows XP, Windows Vista and Windows 7 operating systems. Even though the application is promoted via an official web page, the program cannot be downloaded from it. Despite this, you may find the program running on the computer without your consent, and so Shopop removal may be something you are interested in. Once the add-on is installed onto your Mozilla Firefox and Internet Explorer browsers, it is likely that various advertisements will be presented to you. It has been discovered that the application is closely related to the infamous Snap.do, and so you should not be surprised to face various coupons and deals promoting supposedly beneficial services. Unfortunately, in most cases instead of providing you with legitimate saving options, these ads will be used to boost traffic to random websites. You need to handle the presented ads and offers with caution because some of them could present links routing you to unreliable websites as well. Needless to say, the reappearing advertisements might be extremely irritating, which is why you should delete Shopop to stop them. Did you know that Shopop can spy on you and collect information related to your IP address, screen resolution of the monitor, browsing activity and interaction with Shopop products? Note that most advertisement supported programs are affiliated to third parties who present advertisements and who may have access to certain information collected by the plugin itself. It is impossible to know what threats you could face by clicking on the suspicious advertisements. Virtual data collection is not exactly reliable either. Due to these reasons we recommend that you remove adware as soon as possible. Do you want to delete Shopop from the computer? This is not the most beneficial browser extension you could use, and so we certainly do recommend that you get rid of it as soon as possible. It is most likely that after the removal, the irritating advertisements related to this program will be disabled as well. Use the manual removal guides below or install automatic malware removal software to eliminate all existing threats. Make sure you also choose authentic security software to keep the PC guarded in the future. Select the undesirable application and Remove it. Delete other undesirable programs. Open the Start menu, select Control Panel and then click Uninstall a program. Right-click the program you wish to remove from the PC and select Uninstall. Right-click on the Metro UI start screen, select All apps and open the Control Panel. Go to Uninstall a program, then right-click the unwanted one and select Uninstall. Quick & tested solution for Shopop removal.